Ariela Nomi Kuh is a quiet trendsetter. 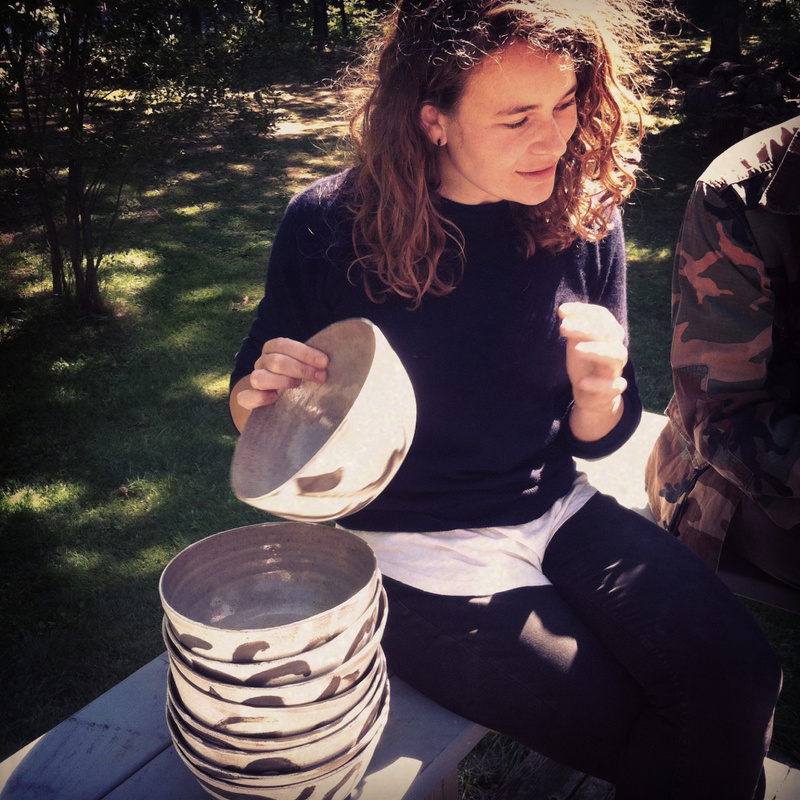 Working from the Lincolnville studio for her Ank Ceramics, she’s produced bowls, serving dishes and the like for Hugo’s in Portland, Earth at Hidden Pond in Kennebunkport and Momofuku Ko, one of New York chef David Chang’s ever growing empire of restaurants. Bon Appétit magazine called Kuh an “artist to know,” so Source called her up to learn about what goes into her spare, elegant work. While we were getting to know her, we talked about her love of food, foraging and fishing. FORAGING A HOME: One of the reasons to relocate to Maine full time was that she met her partner, Evan Strusinski, more commonly known as “Evan the Forager,” here (his skills have been noted in the pages of Outside, New York Magazine and the Wall Street Journal). Strusinski can forage just about anywhere in the Northeast since he delivers mostly by FedEx (he’s sold to Momofuku Ko, among other places), but Maine makes a fine home base. Kuh has done her fair share of foraging by his side, but these days she’s too busy filling orders to get much time in the woods. She does make time for fishing, particularly if mackerel are involved. “I would say that my main hobby outside of the studio is cooking and eating,” she said. Off her own dishes, naturally. IN STOCK: Her website includes the header “Stockists.” What precisely does that mean? “That is a funny term,” she said. “I am not very fond of it.” But it is the lingo for craftspeople who sell wholesale, which is largely what she does. You can order from Ank Ceramics’ website, but most of her sales are made through a wholesale catalog she sends out annually. Locally her work is available at More & Co. in Portland, and she’s working on a line of plates and low, shallow bowls for Maine & Loire’s wine bar expansion on Washington Avenue. Does that kind of product placement drive the business? “Not necessarily,” she said. Plenty of diners focus on the food, not what’s under it. “But I do like working with chefs because I care about food, and I love the idea of (the plates and bowls) getting so much use and being eaten off of every day. WORK BALANCE: With Ank Ceramics, Kuh set out to determine whether or not she could make a sustainable life for herself in midcoast Maine as a potter. Despite promising prospects, the jury is still out. “I love doing the work I do, and I feel very fortunate to be able to work for myself.” But there’s always that question of balance. “Working for yourself involves working long hours and working weekends,” she noted ruefully. “And there’s the question of whether or not that’s how I want to be spending my time and living my life long-term. It is a question that any artist or entrepreneur deals with.” Especially the ones that have to keep their own books. “What I would love to do is just make my work all the time,” she said. “But there is a lot of communicating with clients and organizing and packing and shipping and accounting and sort of self-promotion that you have to do that is just unavoidable.” True. And that sounds exhausting. Pass the coffee pour-over please.